I’m thinking of publishing a new Scripture translation. I’m going to call it The Meme Bible. Meme – a humorous image, video, piece of text, etc. that is copied (often with slight variations) and spread rapidly by Internet users. Bible – a collection of texts sacred in Judaism and Christianity. Spend any time on social media and you’ll see memes. Spend time on social media where Christians post their thoughts and you’ll see Bible memes, complete with chapter and verse, offered to inspire and encourage people through the word of God. 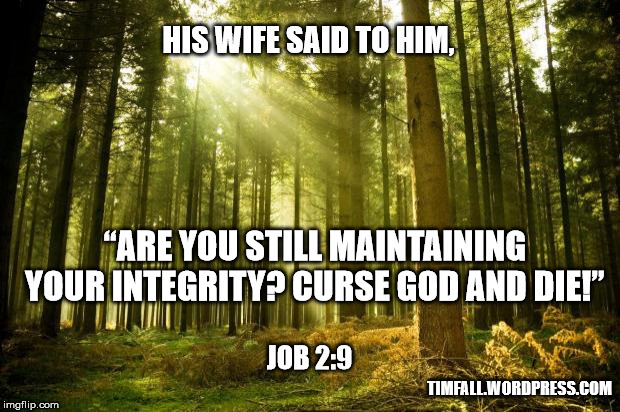 Yet I’ve never seen a meme for Job 2:9b. Instead, I see memes on the blessing of abiding in Christ, and on the love of God and loving one another. They always feature pleasant typeface and compelling imagery such as rainbows, running horses, storm-tossed seas, and more images that draw the eye to the text. Hm, not as encouraging as I’d hoped. Well, that didn’t illuminate my understanding of God as much as I’d hoped either. That one just didn’t bring me any hope at all. When we’re told how Judas died, it’s not an invitation for us to strive for the same kind of death. It’s merely an explanation to help us understand why the rest of the Apostles chose someone to take his place in Acts 2. 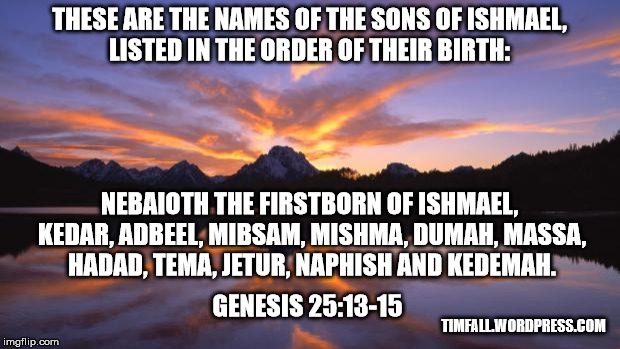 To understand the importance of Abraham’s line of descendants through Ishmael, the passage needs to be read in light of all of Israel’s subsequent history. Context always counts. And the quote from Job’s wife is a product of her grief at losing her children in a horrible accident, one she recognized rightly as being allowed by God. Yet we are not encouraged to emulate her but are given her words to understand the revelation of God’s true character in the final chapters of the book of Job. The need for context doesn’t come up only with verses like those I choose from Genesis, Job and Acts, but when understanding the other verses more common to Scripture memes. For the abiding and love memes you might run across as mentioned above, they are both descriptive and prescriptive: they describe a truth about God and prescribe action on our part. But even memes like these are incomplete. Jesus is the vine and we are the branches. That is true. But to understand a meme referencing what these branches (God’s people) are doing abiding in the vine (which is Christ) you need to read the rest of that passage in John 15 about branches bearing the vine’s fruit, and you should also read Galatians 5 concerning the fruit of the Holy Spirit produced in God’s people. A knowledge of Old Testament passages describing Israel as the vineyard of God would help too. Also, surely the Bible says love is from God and we are to love others as he has loved us. But how great is this love of God? To understand the love of God you need to study Jesus’ sacrifice on the cross and the patient ministry of the Holy Spirit in everyone who belongs to God, as well as read of the relationship God has had with his people from Genesis chapter one to Revelation chapter 22. Memes can’t cover all that. I’m not down on memes. though. They get people thinking and can encourage you to turn to God with your cares and thanks and struggles and triumphs and questions. God’s word, even verses in isolation, can achieve much. A Meme Bible isn’t the most complete way to learn the word of God, but Bible memes can be a good way to get people thinking about God and his word. This entry was posted in Uncategorized and tagged Bible, God's Word, Holy Spirit, meme, Scripture Context, Vine and Branches. Bookmark the permalink. I put Scripture memes on a Pintetest board I named “think on these things”. Having a place to collect the passages and then go back to reflect on them sounds wonderful, Carol. How did you get “meming” pas the spell checker MS cop? I am good at ignoring my computer’s penchant to try to exercise authority over me, PB. That Job meme is the best of all. 🙂 The describe/prescribe distinction is really interesting and helpful. The casting of lots by the disciples to find someone to replace Judas is one example: because they did it, lot-casting must be what we should do, right? … or not? Saying something is “Biblical” because it’s in the Bible, and then just doing it, is the easiest way, but sometimes more discernment and thought is needed. Really interesting (and funny) post today. The problem with laying out fleeces is two-fold form what I can tell. For one thing, nowhere in the New Testament do we see anything remotely resembling it. 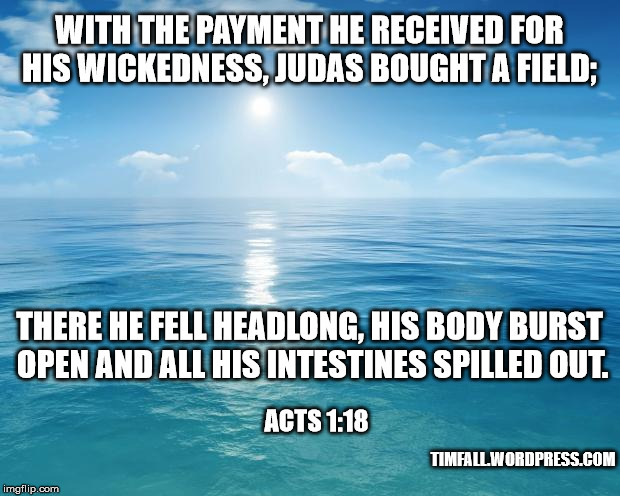 For another, when it happened in the Old Testament it was Gideon’s idea, not God’s. A Meme Bible may not be the Bible we need, but it would be the Bible we of the internet deserve. That’s the first thing that popped into my mind after reading this. But yeah, context is pretty important. It’s sad that it seems like context whether Biblical or even just in general is so often neglected in favor of memes, out of context quotes, and sound bites. Right. It’s one thing to pull a universal truth from a passage. It’s another to say that the nugget of truth is the whole truth on the matter. And when people miss the meaning because they’ve missed the context, it’s dangerous. As you say, Jeremy, it happens with the Bible and a whole lot more. My pastor taught a class on hermeneutics and told us if we could remember only one thing, remember the importance of context. The Job meme is great. But what about Elisha and the bears? (2 Kings 2:23-24) That would be perfect for The Children’s Meme Bible. I’ll get to work on that Elisha meme, Persis. I chuckled at the several you posted above, but this one has me rolling with laughter! One of my favorite Shakespeare lines of all time, MA. If you can get the genealogy record of 1Chronicles into memes, people may read it! I got the ball rolling with the Ishamel meme. I’ll leave the heavy lifting of 1 Chronicles genealogies to more capable memers. Excellent post. Chipper little bible verses are great in their own way, but they’re a signpost to the bigger picture. Too often in our instant gratification, can’t-be-bothered culture, we forget that there is a paragraph around that sentence, a chapter around that paragraph, other chapters around the original chapter, a book around those chapters and a collection of books in one cover that sets the entire context – God’s beautiful word, contained in the bible. This is a wonderful way to look at the layers of context, Sandy. Well done. I am flooded with memes that have a pretty picture of Jesus (think Precious Moments, etc.) that end with “like if you agree, share if you too love Jesus”. I hate “like bait” and “share bait” just so someone can generate a lot of likes and shares. It is pure manipulation. I wanted to create one with a cute puppy that says “If you don’t click ‘like’ and ‘share’ this picture, I will shoot this this dog.” Oh… wait… national Lampoon already did something like that! Thanks for the ‘snort’ producing laughter for this morning. Feel free to share any of the memes here, Kevin. Perhaps they’ll scare away those folks who post the super sugary ones. So, as someone who frequently tries to put myself in the sandals (or whatever) of Bible characters, I am embarrassed to realise and subsequently admit that I have never thought of Job’s wife’s grief and loss before. It’s so obvious, but she’s “written” so harshly and “harridan-ish-ly,” that for some reason it never dawned on me that essentially she was going through the same test as Job. Duh. Thanks for that, Tim. It’s really the first time I’ve stopped to consider her grief to this extent as well, Jenn. Well, that’s a … relief, I guess? Anyway, I’m really grateful for this insight. Tim, you’re good at this, and actually your memes might make a few people think. Thanks, Carmen, I’m hoping they do! Reblogged this on The Writer In Me. These are great, Tim. I laughed out loud when I saw the meme about Ishmael’s sons. I tried to think of a verse that would be suitable for such memes, but it’s hard! Genealogies for the win, Marg!